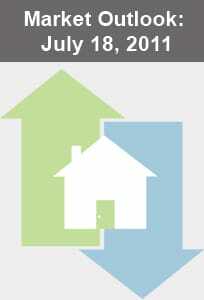 Mortgage rates continued lower last week fueled by concerns regarding employment and statements made in the June Federal Open Market Committee (FOMC) minutes regarding market weakness. The consensus among the majority of the recently released market data and the FOMC minutes is that the overall recovery is still a work in progress and the levels of GDP growth needed to fuel a healthy economy are still a ways off. This is good news for mortgage bad news for the economy as a whole. Mortgage rates have been been held down for weeks as bad economic data has driven bond prices up creating a unique and very likely last chance for home owners and buyers to take advantage of extremely low rates. The concern is that once this window closes and rates begin their inevitable move up, there will be no going back, which means that once the opportunity is gone, it’s gone for good. We can help you understand if you are in or getting into the best mortgage for your needs, please contact us for a free consultation.